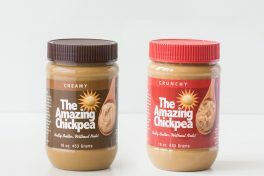 In the tradition of crunchy peanut butters, The Amazing Chickpea has a Crunchy version. Using chopped, all-natural roasted chickpeas for a special crunch that goes perfectly with our delicious chickpea spread. 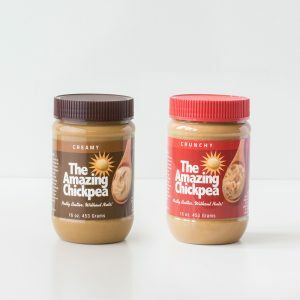 In the tradition of crunchy peanut butters, The Amazing Chickpea has a Crunchy version. 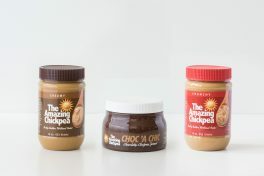 Using chopped, all-natural roasted chickpeas creates a special crunch that goes perfectly with our delicious spread. Easily spreadable on bread, crackers, pita or whatever inspires you. Use as a dip for carrots, apples, pretzels and so much more! Delicious flavor, nutritious benefits, wholesome ingredients. And it makes a great CB&J! The Amazing Chickpea is made without nuts, dairy or gluten ingredients. 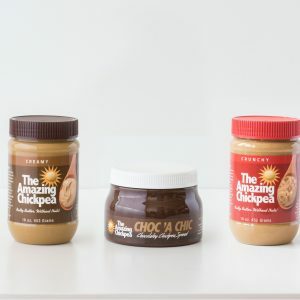 The Amazing Chickpea Spread Tastes like Peanut Butter and has No Nuts* in it. It's main ingredient is Dry-Roasted Chickpeas. *This product is processed in a facility that processes nuts.